According to a new market report published by Transparency Market Research titled “Processed Mango Product Market – Global Industry Analysis, Size, Share, Growth, Trends, and Forecast, 2018 – 2026,” the global processed mango product market is expected to reach US$ 2,043.1 Mn and US$ 31,669.0 Mn for primary processed mango product and secondary processed mango product respectively by 2026, expanding at a CAGR of 6.1% and 7% respectively from 2018 to 2026. Asia Pacific held the dominant market share of the processed mango product market in 2017. Factors such as increasing consumption of mango products, increasing preference for highly versatile and sweet products, and rising awareness about nutritive products are driving the growth of the processed mango product market. However, availability of mangoes only during certain seasons, fluctuations in mango prices, and stringent regulations of food processing across the globe are the major restraints for the processed mango products market. Rise in preference for organic mango products, and increasing consumption across the globe can increase the export value of mango products especially in the U.S. and in Europe. This market has threats from various substitutes of fruit based products in the market. According to the report, the most commonly used products in the global market are primary processed mango products. These products include dried mango, mango puree, mango pulp, concentrate, and IQF mango. Secondary processed mango products are now easily available and are preferred across households. Some of the secondary processed mango products includes mango juice, fruit bar & candies, jam, jelly and pickles. The report offers detailed segmentation based on product type, distribution channel, and region. According to the report, processed mango products witness demand for primary processed and secondary processed mango products with a gradual CAGR of 6.1% and 7.0% respectively in terms of revenue. The report highlights that primary processed mango products such as mango puree, pulp, and concentrate will contribute to a CAGR of 6.7% of during the forecast period. Secondary processed mango products such as fruit bars & candies will contribute to a CAGR of 7.6% during the forecast period. However, demand for mango juice will rise at a brisk rate of about 7.0% CAGR as it sees high demand from consumers. Primary processed products such as dried mango will contribute to a CAGR of 6.1% during the forecast period. The report projects that distribution channels for primary processed and secondary processed mango products will display a growth rate of about 6.1% and 7.0% respectively in terms of revenue. The report also forecasts the online sub-segment of the distribution channel to expand at a CAGR of 6.6% respectively based on revenues of primary processed mango products and secondary processed mango products. Asia Pacific is the largest region of the processed mango product market. 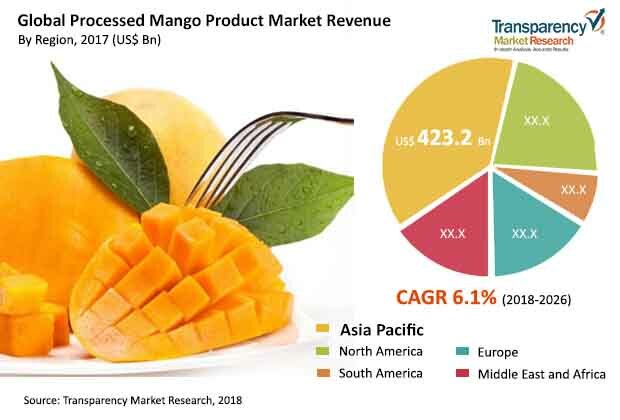 The report projects that the Asia Pacific processed mango product market for primary and secondary processed mango products will expand at over 5.9% and 7.3% respectively and the market is expected to reach US$ 705 Mn and 15,776 Mn by 2026. Demand for processed mango products in Asia Pacific is likely to remain concentrated in India and China due to the presence of larger number of consumers and an application base. According to the report, the South America processed mango product market is expected to grow at a CAGR of 6.7% and 7.1% respectively for primary processed mango product and secondary processed mango product. Middle East & Africa region is also expected to expand at a CAGR of 6.6% and 7.0% respectively for primary and secondary processed mango products. South Africa is expected to generate the highest revenue in the region. The markets in North America and Europe are also expected to expand at a gradual rate for processed mango products. Over the last few years, manufacturers have developed their business models to meet the demand and regulations of the processed mango product market. Major players are focusing on product innovation and collaboration to expand their business. Leading global players profiled in the report are Agrana Group, Allanasons Private Limited, Del Monte Foods, Inc., Jain Irrigation Systems Ltd., Vadilal Industries Ltd., Capricorn Food Products India Ltd., Keventer Agro Ltd., Freshtrop Fruits Limited, Superior Foods, Inc., Dohler GmbH, 7D Mangoes, Sunrise Naturals Private Limited, Valleyfresh Pty. Ltd., The Proeza Group, Varadharaja Foods Private Limited, ABC Fruits, Manbulloo Limited, Galla Foods, and Foods & Inns Limited. Transparency Market Research (TMR) is a market intelligence company, providing global business information reports and services. Our exclusive blend of quantitative forecasting and trends analysis provides forward-looking insight for thousands of decision makers. TMR’s experienced team of Analysts, Researchers, and Consultants, use proprietary data sources and various tools and techniques to gather and analyze information.